The Poets Corner, Brighton & Hove, BN3 5BF. The Poets Corner pub review, map and rating. Looking for a Hotel near The Poets Corner? Poets Corner - great little pub! Food stunning, and what wonderful ambiance - staff friendly and helpful, locals lovely too. Will definitely recommend. went here Sunday just gone as had heard about their roasts. Excellant.large selection i had gammon and friend had beef .very large portions,pleasant atmostphere. Wanted to stay but needed to lie down after dinner. AWESOME LITTLE PUB,JOHN AND SUE MAKE A GREAT TEAM,FRIENDLY AND VERY WELCOMING,GREAT SELECTION OF WINES AND BEERS. been there a few times now,john and sue have really created a great little pub,not the most busy but then thats down to the locals. good craic and the food was great. Have been to the Poets Corner on a semi-regular basis for last 3 or 4 months and have liked it. Laid back atmosphere, mixed crowd, decent beer etc. It was definitely gaining in popularity. Went there this Saturday and the management have changed. Early days but, it seems, not an improvement. All of sudden it seems a much older crowd (not knocking that but before was all ages), no atmosphere to speak of. Also it shut at 11pm, on a Saturday! Back to the bad old days there. Tried the Ancient Mariner for a last pint, it was bloody hideous, in your face club volume disco blaring out with everyone shouting. 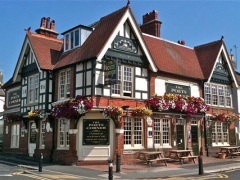 So went to the Three Graces on Portland road, very pleasant but unfortunately has poor ale (Brighton Best is not great). Is probably the only viable alternative in the area if the Poets Corner goes further down hill. Laid back atmosphere, good place for a quiet drink or 2. Good Harveys beer selection: 5 different types on tap.